A Hotel Colonnade Wedding Reception is like no other. It's truly an unforgettable party! But, before the party can start there is always a tiny, tiny window of time where I like to try and get some styled shots of my client's before the wedding reception actually starts. This is an example of one of thous shots. 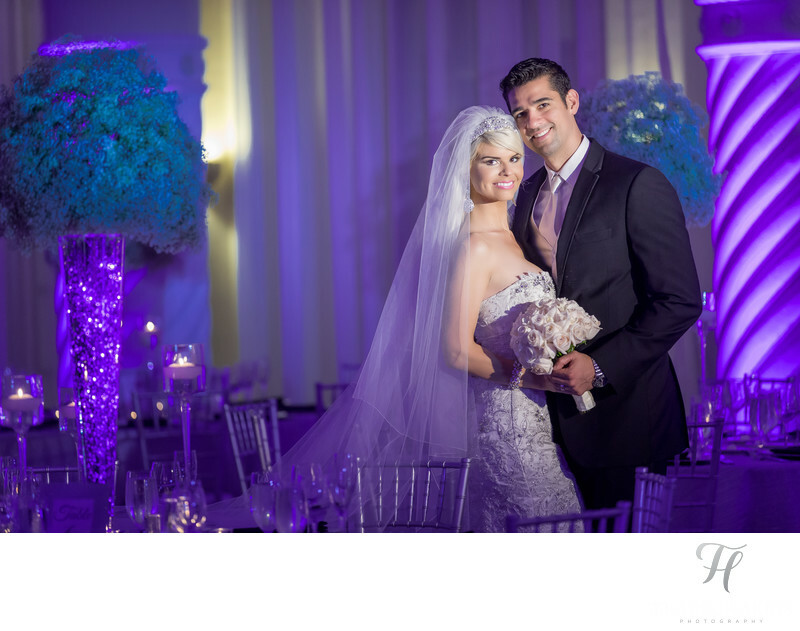 A beautifully lit room with the colored up lights makes for a very unique, and special backdrop. The main lighting for this shot is done with a special LED light that has a very focused beam of light. This allows me to place the light exactly where I need it, and have a nice end result without compromising any of the background at all. This is really important, because if any of the light were to sill onto the background, it will take away from the effect and not look anywhere near as nice as it does here. This image also brings up another very important talking point when it comes to a Hotel Colonnade Wedding Reception, and that's TIME. You need to ensure that you have enough time to cover the setup of the reception, and by this I mean there is time for the photographer to get detail shots of all the tables, cake, sweetheart table, and the full room, and then some styled shots of the two of you etc.. all of this takes time and this must be accounted for, or nice shots like this would never be able to happen.